I think the lotus 24 in the listing is a typo. The backend of this car looks like a lotus 25 not a 24. 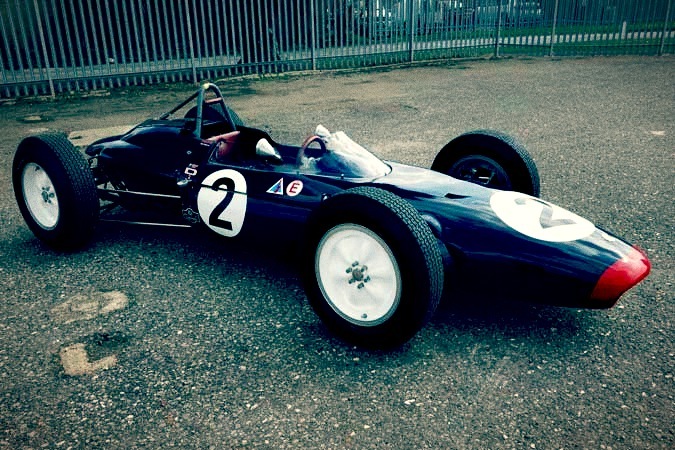 The Lotus 25 was a racing car designed by Colin Chapman for the 1962 Formula One season. It was a revolutionary design, the first fully stressed monocoque chassis to appear in F1. In the hands of Jim Clark it took 14 World Championship Grand Prix wins and propelled him to his 1963 World Championship title. Its last World Championship win was at the 1965 French Grand Prix. Peter Revson was born into the Revlon Family, he was the nephew of Revlon Cosmetics industry magnate Charles Revson, he was an heir to his father Martin’s fortune (reportedly worth over $1 billion). Revson began racing in 1960 while at the University of Hawaii. He previously attended both Columbia University and Cornell University. Revson finished second in a local club event, driving a Plus Four Morgan. He proceeded in his racing career, becoming experienced in Formula cars, Trans-Am sedans, Can-Am Group 7 racers, GTs, and Indianapolis racers. Peter Revson is also famous for Co-driving with Steve McQueen in the 1970 12 Hours of Sebring race, Revson and McQueen (driving with a cast on his left foot from a motorcycle accident two weeks earlier) won with a Porsche 908/02 in the 3 litre class and missed winning overall by 23 seconds to Mario Andretti/Ignazio Giunti/Nino Vaccarella in a 5-litre Ferrari 512S.